The Banff Glacier Experience: This is What Memories are Made of! Get ready for the best Banff Glacier experience! An icefield is like an enormous sheet of ice or an ice cap; it consists of interconnecting glaciers forming a valley of ice. Icefields are formed by an accumulation of snow over many years; the snow is compressed and freezes, turning to ice. The UNESCO World Heritage Site Columbia Icefield in the Canadian Rockies spans the Continental Divide of North America covering 325km² and it is 100-365 meters deep. The Columbia Icefield consists of 10,000 year old ice and gets 7 meters of snow a year. Parts of the icefield are located in both the Banff National Park and the Jasper National Park. The Columbia Icefield feeds 8 glaciers including the Athabasca Glacier, Dome Glacier and the Saskatchewan Glacier. The Athabasca River, North Saskatchewan River and several tributaries of the Columbia River originate at the Columbia Icefield. The icefield is surrounded by high mountains like Mount Andromeda, Mount Athabasca, Mount Columbia and Mount King Edward. So now that you have an idea of the enormity and vastness of the Columbia Glacier imagine walking on it! Well that is what the Brewster Glacier Adventure allows you to do. Brewster snow-coaches (buses with huge "monster" wheels designed for this kind of terrain) take visitors out to the icefield and the Athabasca Glacier where they can disembark and walk around on the ice feeling the expanse and pristine beauty of this untouched landscape. The air is crisp and cold while the ice beneath your feet is crystal clear. The excursion takes you to the section of the icefield located in Jasper National Park and the drive out to the icefield is breathtaking in itself. Along the way you'll pass rugged ice capped peaks and valleys with plenty of local wildlife to spot. 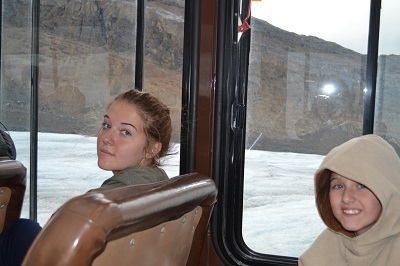 Once you reach the icefield you will drive out onto the Athabasca Glacier, a tongue of ice, 6km long and 1km wide. If you bring a bottle with you can fill it with the fresh ice water for a cool refreshing and very pure drink. Here the guide will tell you about the formation of the icefield and glaciers and explain about the water which melts here and flows down eventually reaching three different oceans. The informed guide will also tell you about the icefield's important in the ecosystem, environment and the role it plays in climate research. Due to the weather Brewster's Glacier Adventures close down for the winter from December to March. The site is open from April to October; Ice Explore tours leave daily, every 15-3 minutes, between 10am/9am and 4pm/5pm/6pm depending on the month. The tours last for about 80 minutes. The tour costs C$49.95 for adults and C$24.95 for kids (6-15) plus GST, kids under 5 can go for free if sitting on their parent's lap. There is no need to pre-book your seat for the tour. The tours leave from the Columbia Icefield Discovery Center which is about 1 hour south of Jasper on the Icefields Parkway and 2.5 hours drive from Banff on the TransCanada Highway and the Icefields Parkway.